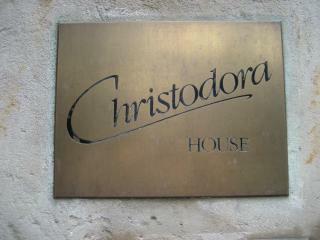 Christodora House is a historic building located at 143 Avenue B in New York, NY. It was designed by architect Henry C. Pelton, (architect of Riverside Church, Manhattan) in the American Perpendicular Style and constructed in 1928 as a settlement house for low-income and immigrant residents, providing food, shelter, education and health services. The building as originally conceived included a gym, swimming pool, music school and theatre. It was financed by Mr and Mrs Arthur Curtiss James, at a cost over $1 million dollars. Reputedly George and Ira Gershwin played at the grand opening. It is fair to say that the building was the most impressive building of its kind, at the height of the American Settlement House Movement. Initially the 16 stories of the building housed a music school, a pool and gymnasium, a library, clubhouses, workshops, offices, and two kitchens. These spaces were on the lower five floors of the building, and open to the public and settlement members. One floor housed the settlement workers, the top 9 floors were rented out as residences to provide income for the work of the settlement. The opening of the building was an event, widely covered in the newspapers of the day. The building, particularly its height and style, were seen as symbolic and inspiring: towering, modern, up to date, airy, clean and fireproof. its character representing the best in the character of the neighborhood. The difficulties, not foreseen, of operating a settlement community and a "residential" community created complications for the Christodora Board of Managers. These financial burdens, coupled with the expansion of public housing, led the building to sold via condemnation to the City of New York in 1948 for $1.6 million dollars. The city planned to house delinquent boys in the building, operated by the Dept. of Welfare. However, the building remained empty or underutilized through 1956. In the mid sixties, a variety of unsanctioned community activity took place in the lower floors of the buildings. This led to a police raid and closure in 1969. This did not stop the activities in the building, as it is reputed that the national headquarters of the Black Panthers was housed in the building. The building also was the site of several pornographic films. The city sold the property for $62,500 in 1975. In 1986 the building had by sold numerous times, and began a conversion process to a condominiums. Christodora House was added to the National Register of Historic Places on March 20, 1986. On August 7, 1988 the Tompkins Square Park Riot spilled over into the Christodora House. Rioters chanted "Die Yuppie Scum" in reference to the residents of the building. The front doors were smashed and rioters ransacked the lobby area of the building. Today, the building hosts a diverse group of residences. Many are active in community groups such as The East Village Community Coalition, which has an office in the building. Famous past or present residents include Iggy Pop, Sigrid Rothe, Vincent D'Onofrio, Freedy Johnston, Marisa Monte, George Pendle, Andres Levin, Douglas Rushkoff, and Michael Rosen.